A group of us will be seeing Anand Patwardhan’s “Reason” at Lincoln Center. If anyone would like to see the movie and also join us for a discussion afterwards, please email info@sadhana.org. This Sadhana Salon will be a meeting to discuss activities of NY Sadhana chapter over the coming year. We will be gathering in Brooklyn, NY. Please email info@sadhana.org if you would like to join us. Sadhana is a cosponsor of this NYC Interfaith Passover Seder. Sadhana’s Pratima Doobay will be sharing a Hindu prayer and reflection. A group of us will be attending this beautiful event. All are welcome. Sadhana Youth Salons are intimate gatherings where we explore a topic relevant to Sadhana's mission and foster leadership among youth aged 15-25. Our inaugural salon will address the topic of Female Heroines in Epic Texts and focus specifically on Mother Sita in the Ramayana and Draupadi in the Mahabharata. We will encourage debate and dialogue among attendees - we know there are many perspectives on this topic! We are limiting attendees only to youth age 15-25. For those who are outside of this age range and wish to participate in similar discussions, we encourage you to attend our general salons. Participants must RSVP to attend. To RSVP and to receive the readings, e-mail Aminta at ackilawan@gmail.com. And anything you like to read on Indian history and politics! RSVP: info@sadhana.org for more details. Something different for Valentines Day! Sadhana Satsanghs are our monthly inclusive, egalitarian and earth-honoring worship gatherings. This month's Satsangh is cosponsored by Caribbean Equality Project and Jahajee Sisters. We will come together to address themes including love, equality and relationships. Relationships are sacred. There can be no peace and justice in the world if we don’t build peace and justice in all our relationships. Please come in pairs with your Valentine (whether that's your partner, your best friend, your sibling, whomever)! After our kirtan, meditation and puja, we will be doing a fun and interactive exercise on how to have a "safe conversation" with those you love! What does a queer Hindu wedding look like? How do Hinduism's diverse scriptures, beliefs, and mythology address questions of gender and sexuality? How can we make religious spaces more inclusive for queer and trans members of our communities? Join Sadhana's Chicago chapter for a panel discussion on Hinduism and queerness, which will address these questions and more! Speakers will share about their personal journeys reconciling their faith with their queer/trans identities. Refreshments will be provided! This event is being organized with support from Office of LGBTQ Student Life - The University of Chicago and Spiritual Life UChicago. A meeting with Sadhana co-founder Sunita Viswanath, under the auspices of Kerala Sanskrita Sangham. Sunita Viswanath, the founder of Sadhana and co-founder and active board member of the international women’s human rights organization Women for Afghan Women, is visiting India for a few days. Kerala Sanskrita Sangham invites you and your friends to be part of an interaction with her, and inter-faith dialogue. Please be present at KP Kesava Menon Hall, Calicut, at 5 pm on Wednesday 23 January. Please join Sadhana's New York City chapter at at our last Sadhana Salon of 2018 on Saturday, December 15th. Sadhana Salons are gatherings where we discuss Sadhana's work and explore a topic relevant to our mission. We have a new location for our December Salon, and a very special guest speaker. A vegetarian lunch will be served; potluck contributions are welcome but not required! Please tell us in your RSVP if you will be contributing the potluck. Sadhana Satsangs are Hindu worship gatherings which are egalitarian and earth-honoring. For this special interfaith Satsangh, we will have a small puja (Hindu worship ritual) and prayers and songs from all our diverse traditions. We will share reflections about the true meanings of the holy days of the season -- including Christmas, Hannukah and Kwaanza. We will also have kirtan, meditation, discussion and light prasad (food which has been blessed by the divine). Our prayers, meditations, bhajans and discourses may be led by individuals of any race, caste, gender, sexual orientation, and age. Each Satsangh focuses theme related to our mission. This Satsangh is a chance for us to come together and reflect on what the holiday season means to all of us, and to pray for peace in 2019. 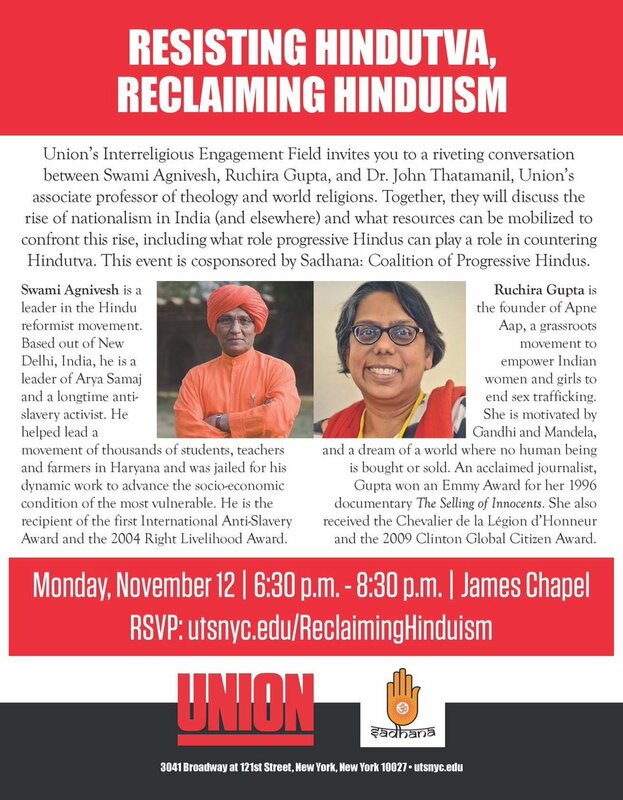 Organized by South Asia Society, NYU and cosponsored by Sadhana. Sunita Viswanath is participating in this interfaith panel. Take Belt Pkwy to Exit 17S (Crossbay Blvd). Meeting Point: Western parking lot near red brick gazebo structure. Free parking in lot! Please join Sadhana's New York City chapter at at our first Sadhana Salon of the fall season on Friday, September 21st! Sadhana Salons are gatherings where we discuss Sadhana's work and explore a topic relevant to our mission. Short readings are assigned before each Salon. The topic of this upcoming Salon is Pitru Paksha, an auspicious and reflective time when Hindus remember their ancestors and all who shape and guide their lives. Please RSVP to info@sadhana.org to receive the readings assigned and other details. Exact location TBD. Dinner will be served; potluck contributions are welcome, but not required. We hope you will join us!